Waves Car Wash, now in Lewes, will be hosting the inaugural Tunnell Tuesday on Tuesday, January 31 (rain date Wednesday, February 1), from 8 a.m. to 5 p.m. Four dollars from every car washed on Tunnell Tuesday will be donated to Beebe Healthcare’s Tunnell Cancer Center. 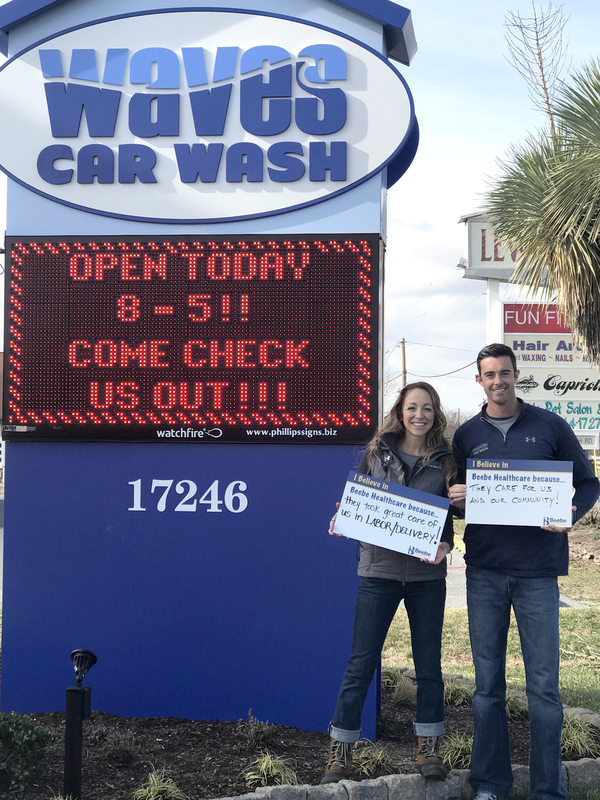 Waves, located at 17246 Five Points Square (next to Walgreens on Savannah Road), is Sussex County’s greenest car wash, offering full service and exterior-only car washes. Anthenelli and wife, Danni, said they knew they wanted to give back to the community before they even broke ground on the new car wash.
For more information or to donate to Beebe Medical Foundation in support of Beebe Healthcare, the local, community not-for-profit healthcare system, call (302) 644-2900 or go to www.beebemedicalfoundation.org. The Robert & Eolyne Tunnell Cancer Center at Beebe Healthcare was established in 1995. It has received the Commission on Cancer's highest accreditation with commendation as a comprehensive community cancer center. Its clinical specialties are medical oncology/hematology and radiation oncology. It also offers a multidisciplinary approach for planning all cancer treatment. Nearly 200 patients visit the center each day. For more information on cancer care at Beebe, go to https://www.beebehealthcare.org/tunnell-cancer-center.